I've been making steady progress on my cashmere featherweight cardigan, knit in my Purple Label Cashmere sock yarn in colourways sand and shadow. I'm knitting it in wide, almost 3" stripes. I'm loving the way that the colours are working together. I opted to do a seed stitch hem and a seed stitch button band (although there are no buttons... is it still called a button band?) 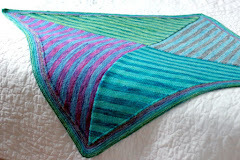 to avoid curling and hopefully add a little bit of structure to the edges of the fabric so they fall and drape nicely. It's a lot of stockinette stitch at a pretty fine gauge, I didn't know I had it in me to knit such a fine sweater, but after the success of my Wispy, I'm feeling like anything is possible! At this point, with the body done and only two sleeves left to knit, I'm worried that I've made the sweater too big for me... but I'm going to just plow through, hope that blocking magically makes it fit me exactly the way that I want it to, and if it doesn't... it'll become a show sample. 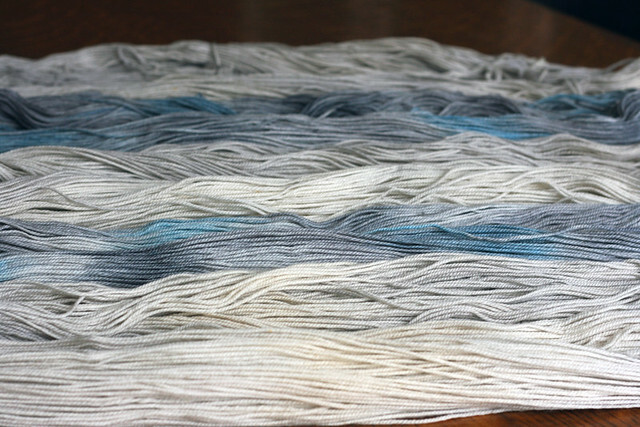 And lastly for today, remember this luscious skein of merino-silk singles I showed you last week? Well, I told you I fell hard for that lacy zigzag cable stitch. I wanted a quick, straight forward project to test this sample skein of yarn that I had (it's a new base that I'm considering... thoughts?) and when I couldn't find a pattern that matched exactly what I had in mind I just improvised and came up with this! Very simple, very chic. 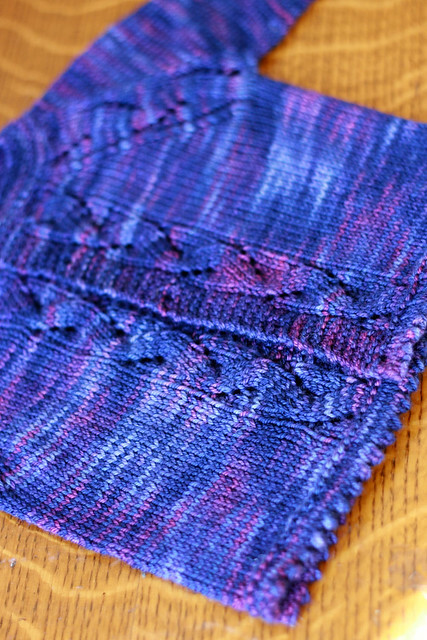 The silk in the yarn really gives nice drape and shine! Any interest in this pattern? It's very simple, I'd be happy to share. Chris and I enjoyed a wonderful quick trip to Ottawa to visit my brother and his Fiancée. I was able to successfully forget about all the work waiting for us when we got home! 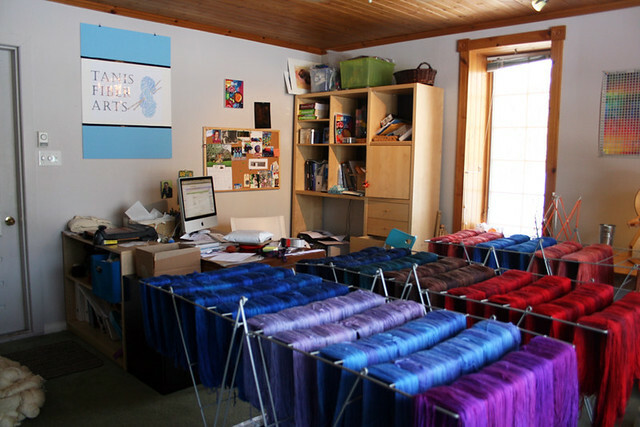 We had done lots of extra dyeing before leaving, because even though we were only going to be gone for a couple of days, we are very busy right now and didn't want to get behind. 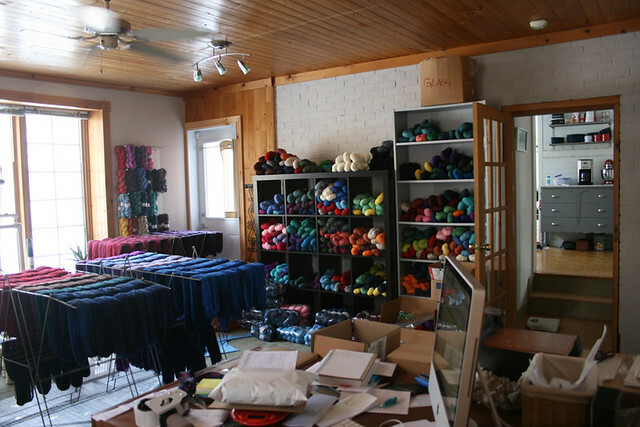 So, we came back to racks full of lovely rainbows of yarn, all dry and ready to be skeined, labeled, packaged and shipped. My mom is out of town this week, and with the Club shipments all ready to go out on top of our usual frenetic pace, I think I'm going to miss having her around a lot, I've gotten used to all her help! Chris and I are taking a quick two day trip to Ottawa with my sister to visit my brother and his fiancée. This will have to be a very fast post because Chris is really rushing me out the door! 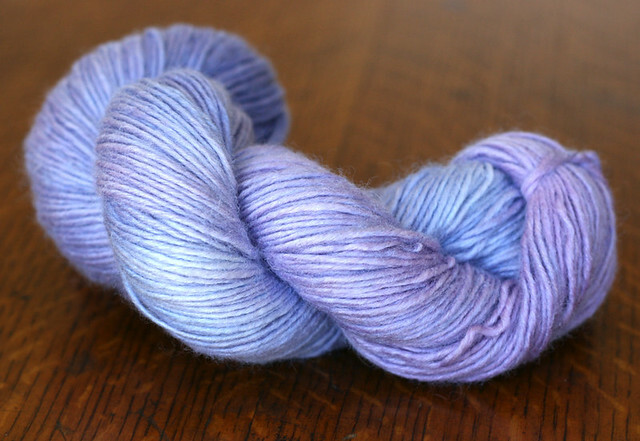 I just wanted to share this lovely little sample skein of merino-silk singles that I've dyed up in my lilac colourway. I'm testing out new yarn bases, looking for my next new adventure! 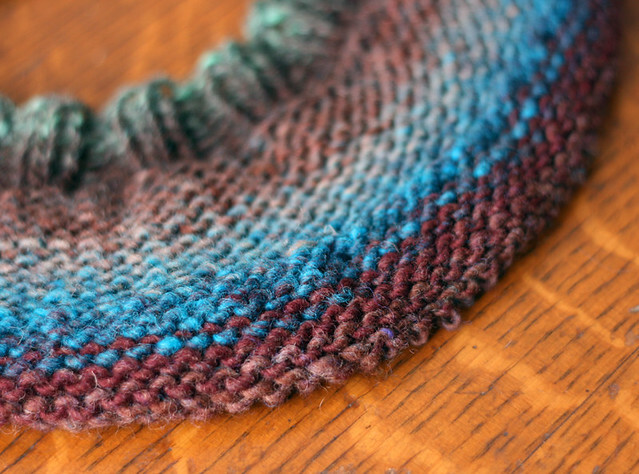 This skein has already been knit into a cowl and is currently blocking. Yum! Ah... it's been blocked, it's had it's FO shoot, and it's even been worn to a party this past weekend, and let me tell you, it did not disappoint! This is my Wispy Cardigan, designed by Hannah Fettig, knit in Tanis Fiber Arts Silver Label Mulberry Silk yarn in the Tidal colourway on 3.5mm needles. My only mods were to lengthen the body so the hem hits right at my jeans, and to go down a needle size in order to get gauge. Other than that, I knit it exactly as directed and it came out perfectly. 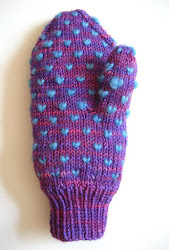 Were I to knit it again in this yarn (and I think that I just might!) I would shorten the sleeves by an inch or two, that way I would be able to get the whole sweater out on one skein of silk, for this version I used less than 10g of a second skein. 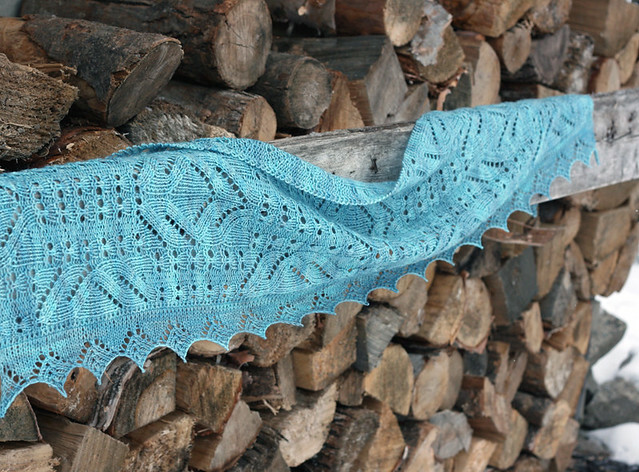 My silk yarn has often been used to knit beautiful shawls, stoles and scarves, but I knew that it was good for more than just fancy accessories, and wanted to show another use for it. This finished cardigan is light and airy, soft and shiny and hits the perfect balance between casual and dressy. Paired with a tank and jeans it's a nice day look, paired with a dress and heels and it's perfect for a night out! Since I don't go out that much I'll be wearing it with jeans more often then not, and I love that it adds a little silky something special to an outfit. I'm also excited about having a spring/summer knit. 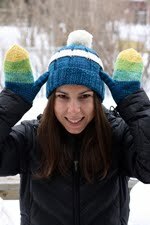 I usually knit heavier sweaters and winter accessories, I don't knit much with cotton or more summery yarns, but it will be very nice to have something knitterly to wear in the warmer months. The design of this cardigan is really very clever. 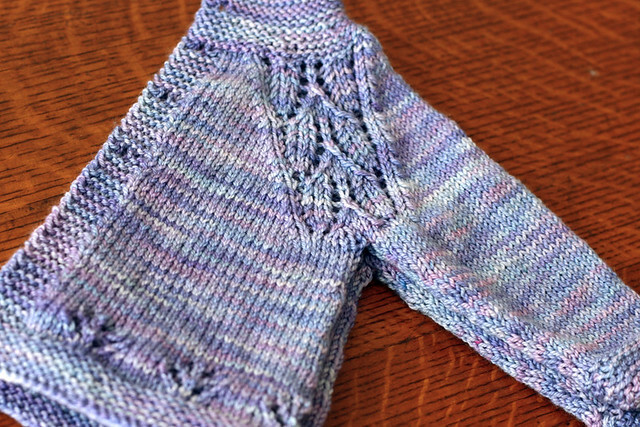 You first knit a shrug and then pick up stitches all around it and continue from there. The result is a cardigan that flows open, done in the silk the fronts drape beautifully and the whole look is really flattering. I love sharing pictures of my home here on the blog. I take a lot of joy and pride in my home. Chris and I love being home owners and especially love putting our stamp on our space. Little by little this house is becoming a true reflection of who we are. There is one space however, that took very little time to become fully ours. The previous owners used this space as a lovely den, but we use it as the office. I can't really explain it, so I'll just share some pics I snapped of it the other day. 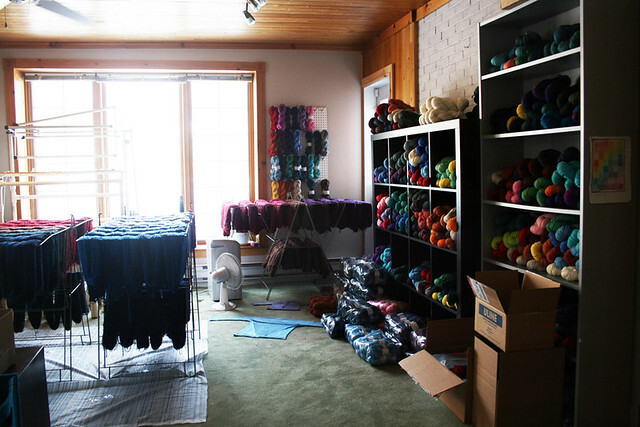 This shot was taken from behind my desk, this is where I spend a lot of my time, watching over my yarns. 1) wind yarn from cones into skeins. 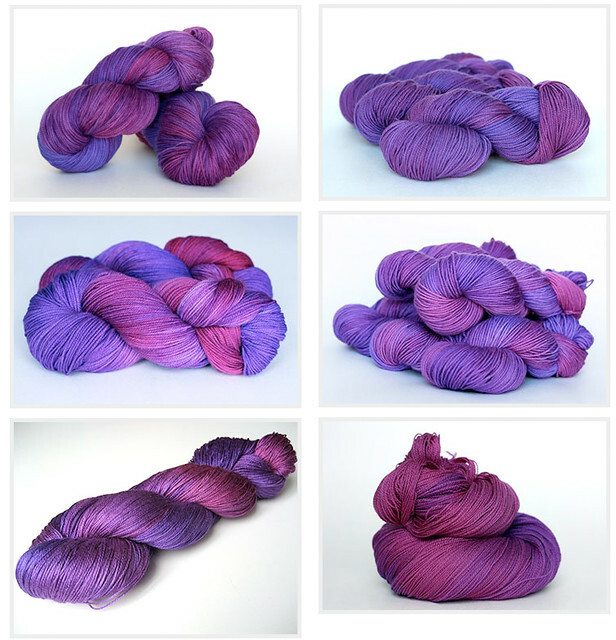 2) wind fully dyed skeins into mini skeins for kits. 3) dry the dyed yarn, we put a shower curtain on the floor, turn on the ceiling fan, floor fan, dehumidifier and base board heaters. It works really well! 4) cut off the extra ties and skein the yarn when it's dry. 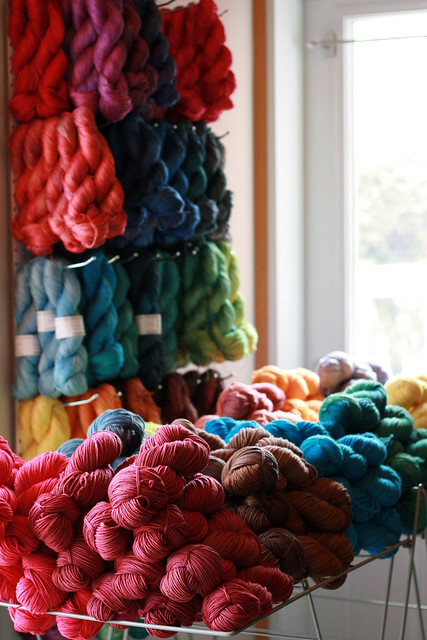 5) store all the dyed yarn. 6) label, package and ship all the yarn. Anyways, all that to say that this space is definitely, 100% ours now. I don't think that there's another room like it in all of Montreal! It's usually jam packed and messy. But it's colourful and cheerful and I love it! Ahh... after months of working on it, the new version of the website is finally up. Actually, it's been up for a little while already, I just needed to some space before I was ready to blog about it. Sitting at a computer screen editing photo's, text and code all day is exhausting! But I'm thrilled with the final result. The layout and the functionality of the site are still exactly the same, we've just taken better photo's and made them larger so it's easier to get a real idea of what the yarn you're buying is like. We still kept it simple, that seems to really work for us, just bigger and better. Hope you all agree! The next update on the agenda was in the label department. We updated the labels about a year ago, but since then things have changed, my business has grown, and my old labeling system had become way too labour intensive. I was spending hours printing, cutting and signing labels, not too mention a fortune on ink! The time had come to make an upgrade. And I couldn't be happier about it! The new labels are glossy, and I don't know why, but to me glossy = professional! So I feel good about that. They also involve a round sticker where I print the colourway name, which I also find looks much more professional and slick. Since I'm not printing them myself, I now also have the luxury of having writing on both sides. This is a very cool bonus because I have been wanting to add more info about garment care and knitting with hand dyed yarns on my labels but didn't have room before. Look for my slick new labels this spring! 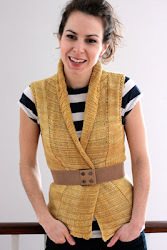 And lastly, now that I've got one lightweight cardigan done, I think I'm going to step right up and start another! This time I'll knit another Hannah Fettig pattern (I'm on a lightweight sweater kick, and nobody does it better then Hannah!) the Featherweight cardigan in Purple Label Cashmere Sock yarn (yum) knit in a large stripe in two lovely neutrals, sand and shadow. This sweater is very directly inspired by Ulli's dusty mauve featherweight which I think is just perfect and gorgeous and the moment I saw it I knew I had to make one for myself. Picking the colours to stripe was very difficult. I really love the way that tonal yarns stripe and I really like to pair similar colours together, shades of turquoise, shades of autumn-y red. I'm very tempted to go with a bolder colour palette, but I think that these two soft shades will make a really beautiful soft look, so I think I'll stick with them. There are just too many options! Chris and I are tackling our first home renovation project this spring, we'll be completely redoing our main bathroom. We have two full baths in our house, one on the second floor and one in the basement laundry room. The basement laundry room bath has been completely taken over by TFA, it's where we do all the dyeing, glamorous right? Because of that, and the fact that we don't have a main floor powder room, the upstairs bathroom is really the only bathroom that we, or our guests, ever use and unfortunately right now, it's pretty terrible! The problem is not only esthetics (though it is ugly) but also functionality. It is small an just very poorly laid out. Anyways, we've done lots of homework and are ready to get the ball rolling (or get the sledge hammer swinging!) On one of our homework days we took a trip downtown to source tiles, on our way we were passing a great vintage furniture store that specializes in mid-century modern furniture, so we decided to pop in and take a peak around. We left with the most perfect chair in the world! I love this chair. It is just stunning. We wanted a chair that coordinated with our large sectional sofa, but wasn't too matchy-matchy. We wanted a chair that didn't take up too much space since we don't have that much space to spare. 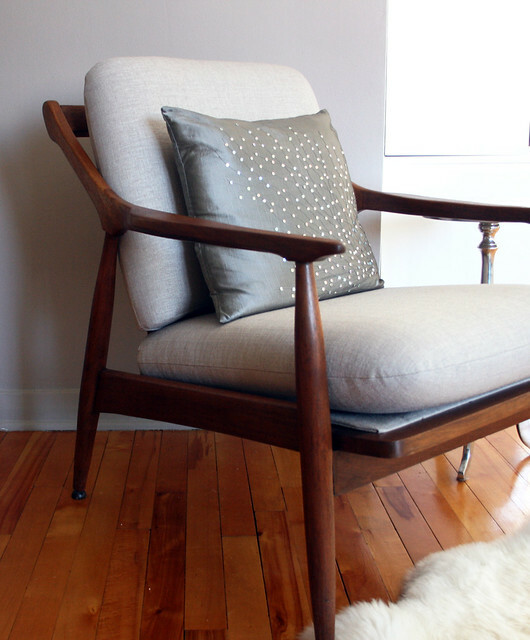 And we really love the Scandinavian, mid-century modern style. I really love buying vintage for several reasons, first, because I find that it adds a lot of soul, personality and uniqueness to a space. And second, because in my experience, good quality vintage furniture is often much better quality than new production. I'm really on a vintage quality kick right now because I purchased an expensive new hip office chair less then a year and a half ago and it's already coming apart, very disappointing. So, there's our new chair, so much goodness, so much to love! 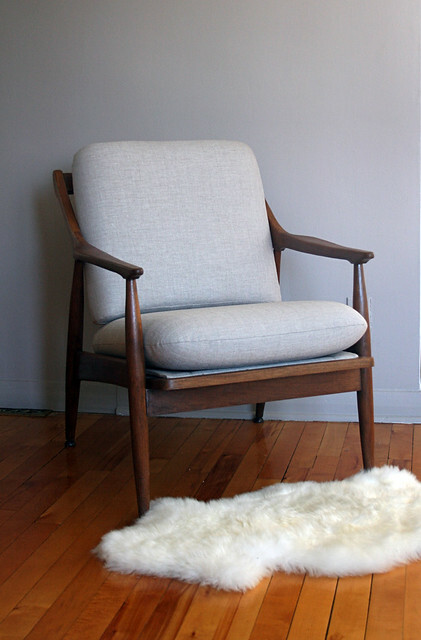 It's very comfortable, it looks great from every angle, and the warm wood tone paired with the beige/grey upholstery is a match made in heaven. Love. I, like many, fell off the wagon and immediately purchased the Liberty of London mini rainbow bundle from Purl Soho. They make it so easy! I showed restraint and bought the small, $50 stack rather then the stunningly gorgeous, covetable and pricey colour-wheel kit. I bought it thinking that I would make a beautiful little quilt, but when I got it in the mail, knowing that I wouldn't be making a quilt any time soon and thinking that the fabrics were far too beautiful to hide away in my stash until I got around to them, I decided that it was time to switch up my circle wall art. I don't know why I hadn't thought of it sooner! After all, the Purls Liberty of London swatch portraits are what inspired my blue wall art in the first place. I loved the blues, but I was ready for a change. These fabrics really add a nice dose of warmth and charm to the space. When I was removing all of the blue swatches from the rings I discovered that they were still as good as new. I didn't cut the fabric, I just put them in the embroidery hoops and ironed them towards the back, so all the extra fabric was hidden, but I didn't waste any. I did the same with the Liberty of London fabrics, I wouldn't dare cut them up! And now I know that when I am ready to make a quilt out of these, I'll just take them out of their hoops, wash and iron them and they'll be as good as new! I should have taken an "after" shot, but I didn't, the house isn't quite as tidy today, I've got a stack of boxes ready to go to the post office cluttering up the staircase. 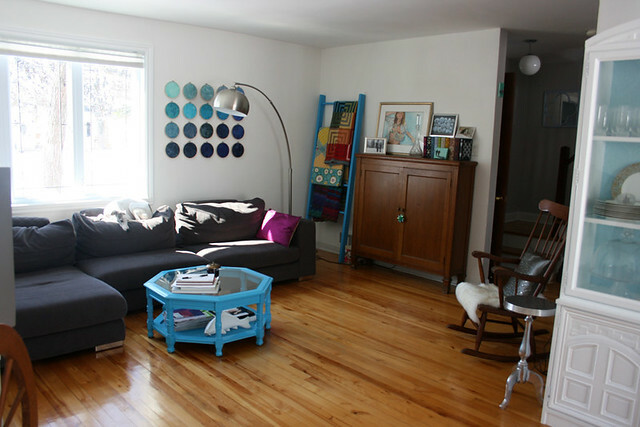 This is what the living room looked like before with the blue circles and the rocking chair. 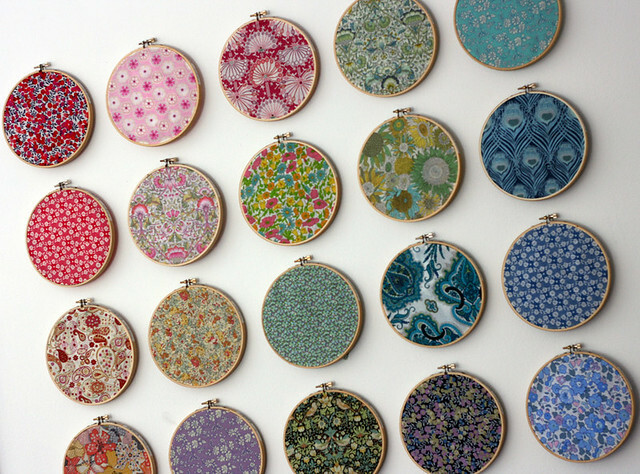 Picture it with Liberty of London circles and the perfect chair instead. I finished knitting my Maile cardigan last week. I just need to pick up some pretty little purple buttons and then give it a gentle blocking and it will be all done. For now, I'm just keeping it next to me at all times should I get the urge to snuggle. My mom was over yesterday and when she picked it up she literally swooned. I don't know why it didn't occur to me sooner, but baby knits are the perfect use for this yarn! It is so soft and squooshy and snuggly, I just want to put it on an infant and then give that infant a big hug! 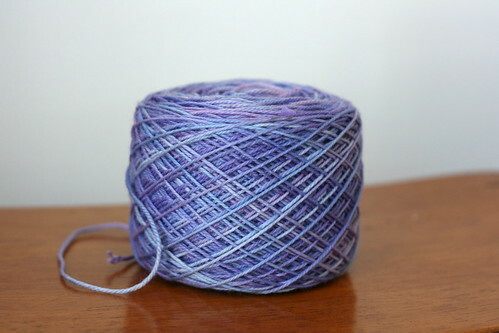 Yarn is TFA Purple Label Cashmere Sock in Lilac. 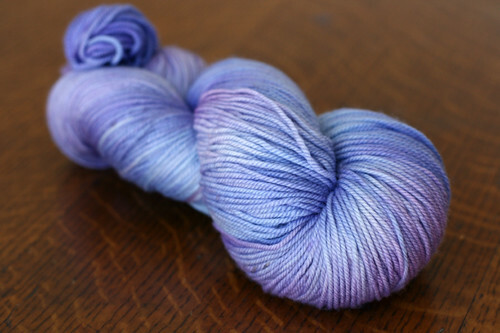 I'm starting to dye the March colourway for the TFA Year in Colour Club and it occurred to me that I never shared the January installment with you all! I wanted to make sure that every Club member had received their package before I blogged about it, I think it's safe to say that I've waited long enough and I won't be ruining the surprise for anyone! I kicked off the Club with a lovely, soft shade of blue. Not much of a shocker there! 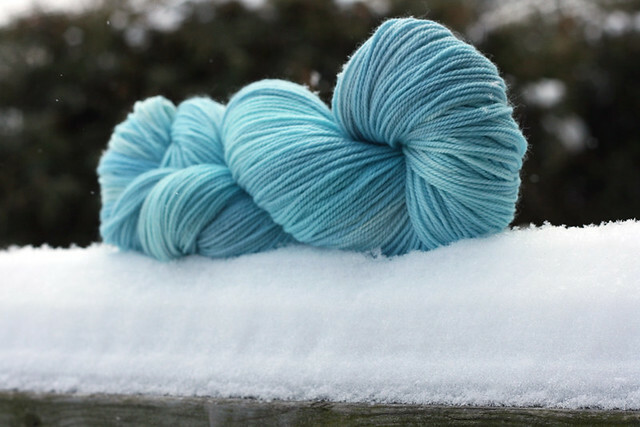 This colourway that I've called Frost really reminds me of cool winter days, perfectly appropriate for a crisp January in Montreal. 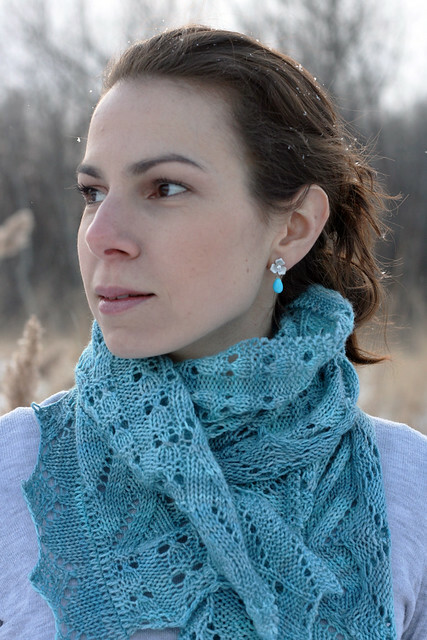 Tanis Gray designed the beautiful Itasca stole for the Club. It was very exciting to see my dream of a TFA Club come together and become a reality. 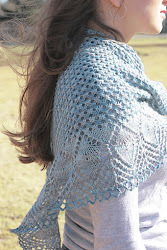 Great yarn, a great design and great knitters! Thanks so much to all the wonderful members! Memberships are open all year, if you'd like to sign up now you'll receive the January and March shipments together. I've got a couple new projects on the needles. Looking at them today I couldn't help but notice that they are all lovely, cheerful and springy in their colours. 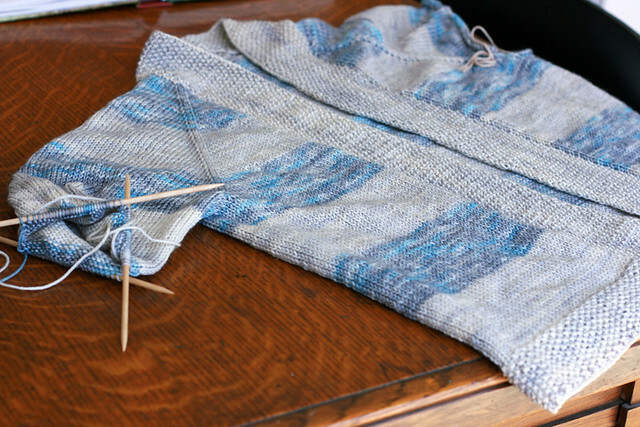 First up, I'm knitting yet another dipped yoke pullover. Like my Dipped Infinity and my Dark and Stormy, this time the yoke is being worked in my favorite shade of Kureyon (#156) and is in reverse stockinette stitch. Simple texture. 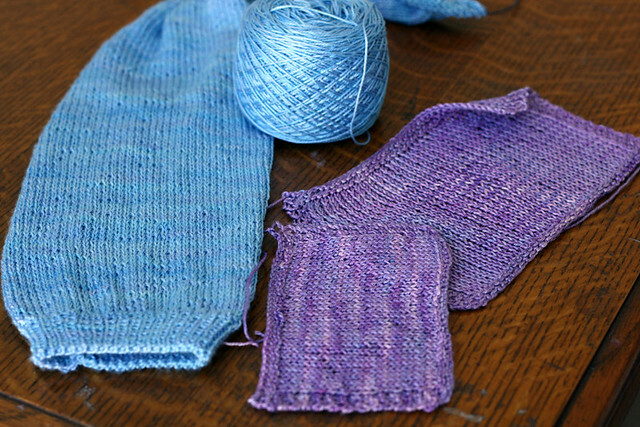 Yesterday I became obsessed with the idea of knitting myself a Whispy cardigan in my Mulberry Silk yarn. I've already finished on sleeve and am working my way across the back. It's so shiny and pretty! 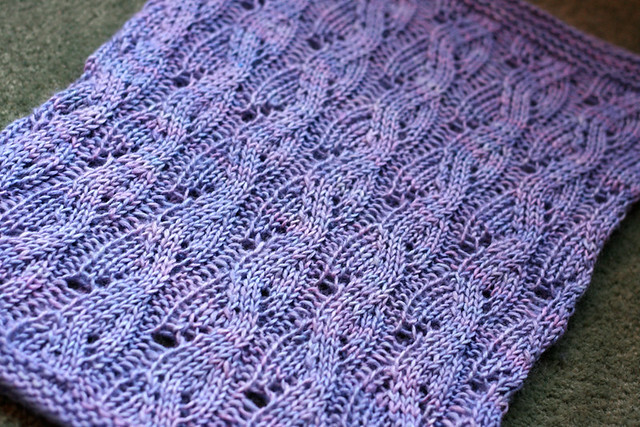 I swatched in leftover purple silk from when I knit my mom her Mother of the Bride shawl. Next to the Tidal sleeve it really looks like spring flowers to me! Then this morning I got an e-mail from a good friend announcing that she is expecting a baby girl! We already knew that they were having a baby, but now that I know that it's a girl I have the perfect first knit for her. The Maile cardigan, simple and sweet and oh so snuggly knit up in Purple Label Cashmere! 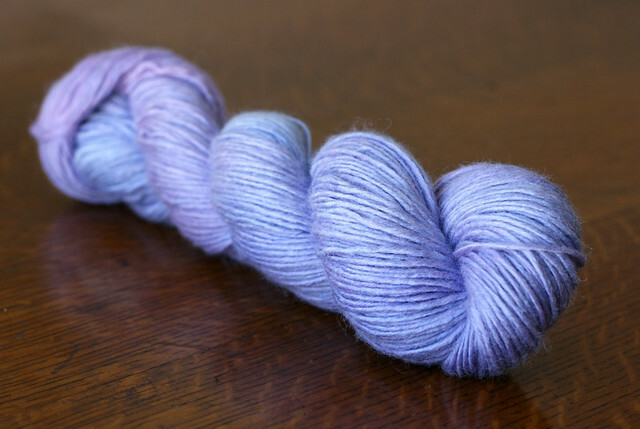 I've been wanting to knit something in Lilac for a while now, it's been jumping off the shelves at me. This is the perfect little project.